My original thoughts when first coming down to Sydney would be that I would do one post covering my whole trip. I figured I would do everything in a nice, wrap-up style blog with lots of content, but after spending 4 out of 5 nights at RedOak Boutique Beer, I feel I wouldn’t be doing them any justice by making them a Cliff Note. 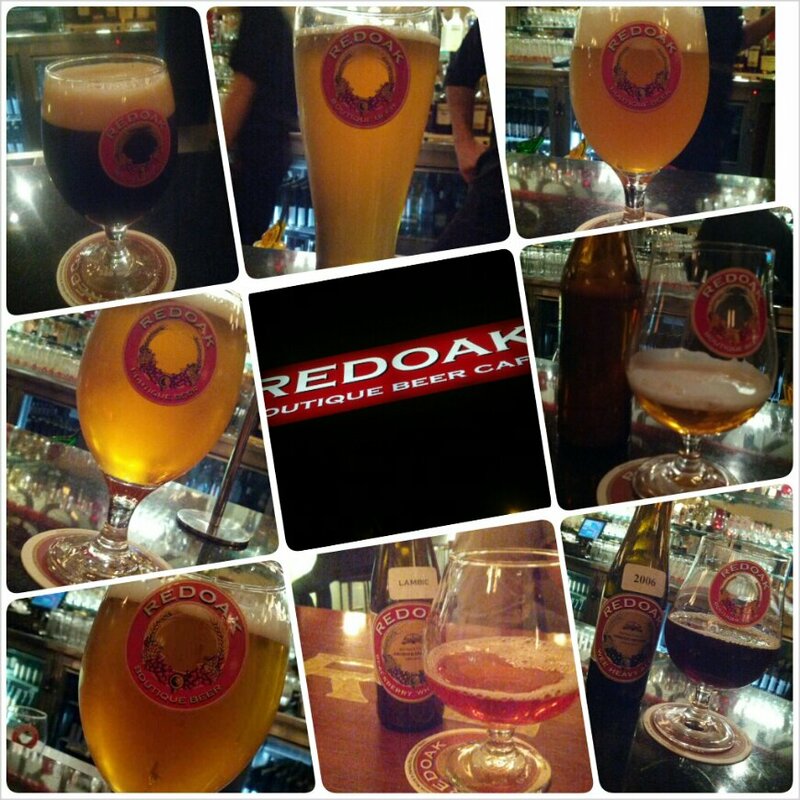 Located at 201 Clarence St in the heart of Sydney, Redoak caters to both the beer snob and non-beer drinker alike. It’s atmosphere is laid back but sophisticated, with a bit of old world charm. Their selection is plentiful and the taps are always rotating with something new and fresh. What really impressed me was the staff. From the moment I walked in, I was greeted with a warm smile and feeling of ease. As I strolled up to the bar, I could tell the staff were enthusiastic and well versed on the beers they were serving and were more than willing to have a chat with you about them. Being a beer snob myself, we were able to talk about the subtle aromas and flavours that each beer presented. This was all fine and good, and kind of what you expect from an establishment like this, but what caught my attention while I sat at the bar drinking my “2006 Wee Heavy Ale”, is the conversations between the bartenders and the beer newbies. Drinkers of your standard Big Brew beers are easy to please by finding a nice light lager or easy drinking Pale Ale, but these guys were handling wine drinkers as well. By simply listening and talking about their preferences in vino, they were able to find a beer that matched their tastes and no one walked away unhappy. Have you ever wanted to drink a Christmas Pudding? This is the beer for you! You get a huge spice hit in the aroma and the taste is similar to nutmeg. Slightly weaker in the flavour department though in the finish but all in all, this was a very interesting beer. Would be great to have around a Christmas fire! This beer was apparently made using WeetBix cereal. It’s decisively hoppy for a Golden Lager, but I’m not going to complain. You smell a lot of citrus fruit on first whiff, but a nice strong pine flavoured punch when you are tasting it. This beer goes down very well and would be really easy to race through a few of these before you knew what hit you. Such a well balanced beer. It’s got a fruity flavour to it, but it’s matched with a malty richness which is kind of like a caramel. You also get a nice little sour hit at the end. Great beer if you prefer something a bit heavier. Pucker up! From the first smell to the last sip, your getting smacked in the teeth with raspberries. Fruit beers for some are an acquired taste, and even this might be a bit much for those who appreciate them, but the huge level of flavour and tartness made this one a top choice for me! This beer actually made me sad. The closer and closer to the bottom of the glass I got, the better it was. Only problem with that was the better it got, the less I had, and I knew it had to end. A tear was shed. The Wee Heavy was fully flavoured with a smokiness that mellowed away to a sweet malt and finisheed with a peat flavour of whiskey (it’s aged in whiskey barrels). My best description of this would be “earthy”. Drink this while wearing your best flannel shirt, swinging your axe to chop down some trees to feed your fire. Lumberjacks are “earthy”, right? Redoak has some food pairing with their beers as well, with a rotating daily special. I had the meat pie which was paired with the Organic Pale Ale. The combination of the two went very well together as the gravy in the pie was very rich, and the beer itself very crisp. I don’t think I could have finished the pie without it, to be honest. For the sweet tooth in you, you can also check out their beer infused desserts, which include a variety of beer and fruit sorbets and a Banana, Chocolate and Beer Bread Pudding. Although Redoak took a lot of time I could have spent exploring other locations, the sacrifice made was well worth it. Out of 4 nights being there, I hadn’t had a single repeated beer or one I regretted. For me, the biggest draw is the staff; knowledgeable and personable and ready to welcome all comers. Definitely worth the stop in Sydney.